In recent weeks, I was negotiating with a potential domain buyer, using the assistance of a Uniregistry Market broker. The broker made several attempts to educate the buyer, who represented his own company, on the domain’s valuation. The aged .com domain consists of two generic, descriptive words. My asking price, in the low five figures, was defined by my long expertise as a domain investor, and was supported by sales figures of similar keyword domains, as provided by the broker. During the communication, it was evident that the other party was looking for a back and forth of bargain-tossing exchanges. I made it clear, through the broker, that the domain’s exceptional qualities allowed for very little discounting in price, but the buyer never increased their offer for me to consider countering. The broker informed the buyer that my asking price would be retracted, if they didn’t counter close enough. A week after I asked the broker to close the transaction as incomplete, I revisited the inquiry, as I had new information about the buyer’s intentions. To my surprise, they had submitted a screenshot from GoDaddy, apparently after querying the domain and receiving a valuation for it. Keep in mind, that I do not list domain names at GoDaddy’s marketplace, or Afternic. In fact, I have zero domain names at GoDaddy, as a domain registrar. The “domain valuation” by GoDaddy for a domain that is not in their system, directly interferes with my process to sell it. Their valuation, as seen in the capture sent by the potential buyer, provides an arbitrary number, generated by the infamous GoDaddy AI. The “comparable domains sold” section was based on two domains sold on GoDaddy marketplaces in 2011, and one I could not verify. When a potential buyer utilizes a GoDaddy valuation to justify their low-end offer, that’s a direct meddling with a selling process taking place on a separate domain selling venue. I could not replicate the response seen on the image, by visiting GoDaddy.com. They either run an A/B test, or they have changed how it is presented to potential registrants of domains. On a related note, GoDaddy charges $69 dollars for domain brokerage initiated through them, for merely attempting to acquire a domain from its registrant. It is my policy to ignore these communications entirely, not pitying the person’s $69 dollar loss, who chose to sidestep a simple contact form on the Uniregistry Market that I use. I get where you are coming from Theo, but GoDaddy is credible to a lot of people outside this industry in rendering an appraisal. GoDaddy just resonates for so many of these people and it can be frustrating. Sounds like they would have never been a buyer and were just lowballing you. Good luck with it on the next buyer. Raymond – My own valuation of the domain, with additional feedback from the Uniregistry Market broker, completely dissolves the domain valuation “credibility” that GoDaddy enjoys, as you claim. The buyer clearly used the GoDaddy domain valuation results, as a last resort to justify their offer. Still, they were a valid potential buyer – not some reseller attempting to get a five figure domain for four figures. 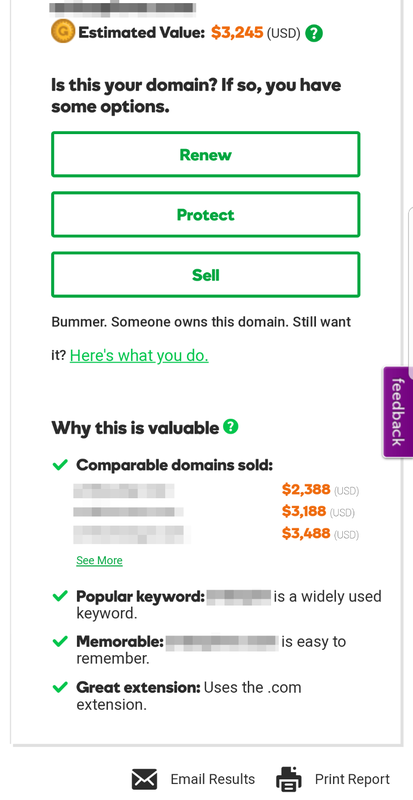 This isn’t just a demonstration of the GoDaddy domain valuation widget’s failure to generate an accurate appraisal, it’s a demonstration of how it directly affects negotiations that are taking place OUTSIDE of the GoDaddy marketplace; the latter, is rather alarming, as far as I am concerned. DG – Don’t get me started there, three figures LOL. The difference is, Estibot is not an 800lbs gorilla of a registrar. So when GoDaddy appraisals have the potential to influence buyers and cause them to be defensive about their offers, these appraisals can do much more damage during the course of a negotiation. I will now have to preemptively communicate to buyers why such automatic appraisals are untrustworthy. Yes i ageee this is a big problem. Potential buyers are misled by these valuations. Tell the prospective buyer to call godaddy and buy the name from them for $3245. I just had a discussion about this very subject. The problem I have with the GoValue is that it doesn’t consider other available comparable domains and their pricing. Example, I price my domains based other “available” domains listing prices. Sold domains as a basis for current value is not accurate. Often the sales are old and mostly represent auction sales, not retail sales. It would be like using mostly foreclosure properties to appraise real estate. Anyway, bottom line is that owner prices domain where they want. Buyer can argue but seller will decide if sale happens or not at a particular price. David – I believe the valuation tool by GoDaddy only takes into account past GoDaddy/Afternic sales. Although GoDaddy sells a large volume of domains, I don’t believe that their average sales price exceeds that of other marketplaces, including Uniregistry Market. Having a broader picture of past domain sales – that again, don’t fully determine a domain’s value, as you said – would help. What you said above and what I mentioned are two different things, if I was an outsider to the industry a business looking to buy, GoDaddy’s credibility does not get dissolved because of your opinion. Not for me, I could easily look at it as you are biased you own the name, I have never heard of Uniregistry so their opinion means little to me, so no GoDaddy’s opinion would be held highest for me. Again I am not saying that as me, experienced domain investor, researcher, but rather as an outsider who never heard of Theo Develegas or Uniregistry. Raymond – Good one. But my negotiation was done via a Uniregistry broker, not by me in person, so your argument over my presumed fame vs. that of GoDaddy, is moot. You’d be surprised by how many end-users are familiar with Uniregistry as a domain selling venue, however. I’m baffled seeing that you are defending GoDaddy on this one. This is a prime example of meddling with domains listed on a different sales venue – competing, no less – which are not even registered at GoDaddy. As for being “biased,” my valuation, and that made by the Uniregistry broker, was conservative. I could have asked for more money. GD can improve this. First You can’t use figures from 10-15 years ago to get your value. I see names that we bought that long ago being compared on the system. Here is a perfect example domainnames.com is valued at 20k on the system yet they take domainnames.mobi which was sold at $12,600- That was sold long ago. Now anyone would buy this for 20k. If they used the sale of domainname.com as a comparable then the name goes up 50x. Second they need to put in a “range of value” and not exact number. This leaves room for the buyer and seller to work out a price. They will sell more names this way. Once you put in value the buyer will never want to go above that. It will be good for what they built this for names in the 1-5k range. Bottom line is they want volume and the domain owner is not who they built this for. But they can improve this for themselves and domain owners if they care by putting in the value range method. I apologize for the delay in getting back Theo I forgot about this thread interaction and just read your new post and looked at recent comments. First off I was not slighting you or your fame, I said you own the name, you would have bias, again I think I stated me as an outsider knowing nothing about domain industry. I guess it would have been best if I had not commented, feel free to delete them all.